The perfect mix of classic and contemporary readings. The most relevant textbook for today’s students. The Real World succeeds in classrooms because it focuses on the perspective that students know best—their own. 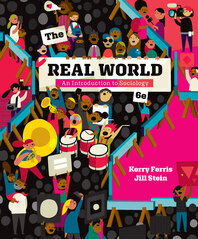 In every chapter, Ferris and Stein use examples from everyday life and pop culture to draw students into thinking sociologically and to show the relevance of sociology to their relationships, jobs, and future goals. Data Workshops in every chapter give students a chance to apply theoretical concepts to their personal lives and actually do sociology. NEW Relevance boxes and examples draw from everyday life, pop culture, and the media. NEW Relevance boxes explore topics such as growing wealth inequality, virtual reality, and the Zika epidemic. NEW pop culture examples and a revamped race and ethnicity chapter keep the text relevant to both students and instructors. Online and in-text tools help students master core concepts. InQuizitive—Norton’s formative adaptive learning tool—helps students master core concepts and come to class better prepared. NEW “Writing for Sociology” online tutorials give students an innovative new way to develop skills such as evaluating sources and writing an effective introductory paragraph. Unique Data Workshops in every chapter give students the opportunity to do sociology. Data Workshops bridge the gap between sociology as a perspective and its real-life applications. Two types of workshops—“Analyzing Everyday Life” and “Analyzing Media and Pop Culture”—have students apply their budding sociological imaginations to what they see in the media and in their everyday lives. Every Data Workshop has students apply one of the research method covered in Chapter 2, reinforcing the important role of methods in sociological research. A robust support package makes it easy to adopt The Real World approach. In addition to InQuizitive, a Coursepack for Blackboard and other learning management systems provides you with a customizable or out-of-the-box solution. The popular Sociology in Practice video clip series now includes a NEW volume with clips from documentary films exploring issues surrounding gender.